This eBook in the Advances in Anticancer Agents in Medicinal Chemistry series continues the concept put together so well in the first volume of the series. By drawing on original articles published during 2008-2010 in Anticancer Agents in Medicinal Chemistry, and having them updated, the volume provides up-to-date reviews on a wide range of drug classes, including marine macrolides, metalbased complexes and glycoconjugate-based vaccines. Also discussed are biological targets through which to control leukemia stem cells, mitosis, metastasis, DNA repair and estrogen receptor modulation. Michelle Prudhomme, Editor-in-Chief of Anticancer Agents in Medicinal Chemistry, is to be commended for this new series, and for the selection of such a wide-ranging set of interesting reviews in Volume 2. 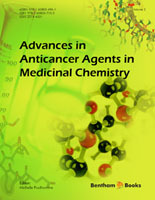 In Volume 2 of the eBook series Advances in Anticancer Agents in Medicinal Chemistry are gathered chapters on several classes of molecules exhibiting anticancer potentialities as well as some important targets for the development of novel anticancer drugs. Marine macrolides are fascinating molecules with a large number of chiral centers. In the first chapter of Volume 2, Antonio H. Daranas, José J. Fernández and colleagues discuss the potential of marine macrolides in cancer therapy. Various families of marine macrolides and their biological targets are presented. Since the discovery of cisplatin, a huge interest has been paid to metal-based complexes as anticancer drugs. The second chapter by Chang-He Zhou et al. reviews the recent research and development of organometallic supramolecular complexes as anticancer agents. Whereas in the third chapter, Dolores Fregona and colleagues develop the potential of gold-based anticancer agents, in particular gold(III)-dithiocarbamato complexes which, due to their lower toxicity compared to the platinum drugs, could provide an interesting alternative. In the search for anticancer vaccines, recent synthetic strategies towards glycoconjugates have been developed. These strategies and the development of glyconanoparticles are reviewed by Laura Cipolla and co-workers. Isatin is an oxidised derivative of indole. Various substituted isatins exhibiting anticancer properties have been identified in plants and microorganisms. Isatin is a simple and excellent scaffold for the construction of new compounds of biological interest. Kara L. Vine, Lidia Matesic and colleagues summarize the recent structure-activity relationship studies on isatin-based compounds as anticancer agents. The tripentone family represents a promising class of compounds, some of them exhibiting a potent cytotoxicity towards cancer cells. In their chapter, Patrick Dallemagne and collaborators review the different synthetic routes to tripentones and the emergence of the highly cytotoxic MR22388. Endocrine therapy targeting to estrogen receptors (ER) and especially ER alpha has been very successful in the treatment and prevention of breast cancer. Virgil C. Jordan and co-workers provide an excellent update on the potential of selective estrogen receptor modulators. Leukemia stem cells (LSCs) are defined as a small cell population required for the initiation and maintenance of leukemia. The chapter by Shaoguang Li and collaborators gives an overview on the development of new therapeutic strategies and drugs targeting LSCs. Glioblastoma (GBM) is an aggressive disease associated with a poor prognostic due to a rapid migration of the GBM cells. In this review, Cory Adamson and colleagues describe various potential targets that may be exploited to inhibit the migration GBM cells. The last chapter by Yves Pommier et al. is devoted to a DNA repair protein Tyrosyl-DNA phosphodiesterase 1 (Tdp1), an enzyme implicated in the repair of irreversible Top1-DNA covalent complexes. Rationale for the development of Tdp1 inhibitors for cancer therapy is discussed.